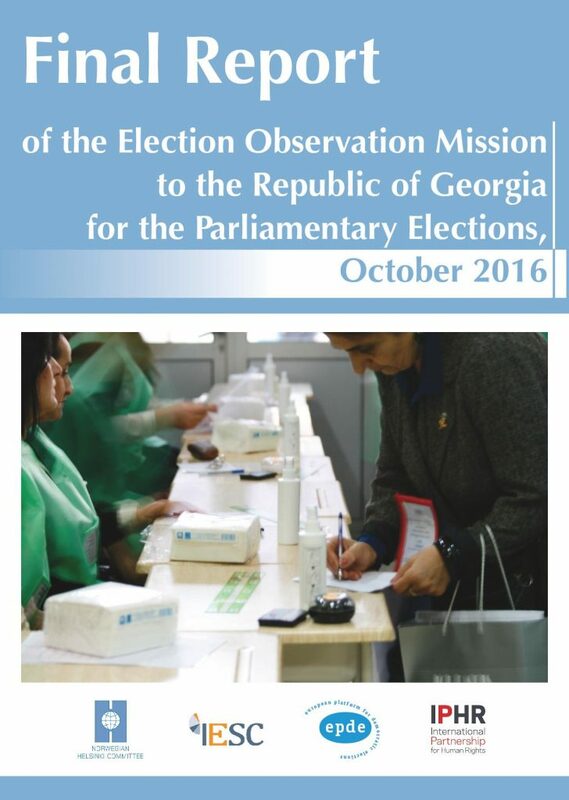 A joint international election observation mission launched by the International Elections Study Center, the Norwegian Helsinki Committee, International Partnership for Human Rights and the European Platform for Democratic Elections concluded that the October 2016 parliamentary elections in Georgia were generally in line with international standards and showed that the democratic process is gradually being consolidated in the country. However, the mission also identified a number of issues of serious concern that need to be addressed by relevant authorities as a matter of priority. The joint NGO mission deployed 36 observers who visited more than 200 polling stations across the country during the first round of the parliamentary elections on 8 October, and 16 observers who visited more than a hundred polling stations during the second round of the elections on 30 October. A long-term observer monitored the final stage of the election campaign. The findings of the mission are detailed in a 20-page report. Overall, the mission assessed the elections, the campaign environment and the electoral framework favourably. A statistical analysis of the bulk of the results of the first round of the elections also suggests that there were no serious irregularities that may have significantly influenced the outcome of the elections. There were important improvements in the electoral framework prior to the elections. Amendments to the election law addressed the problem of wide discrepancies in size between electoral districts and ensured that the vote was more equal than previously. However, the parliament did not adopt a proposal for securing gender balance nor forcefully address the issue of minority representation. A total of 24 out of 150 members of the new parliament are women, while 11 are from ethnic minorities. This means that 16 percent of all deputies are women, which is significantly lower than the UN target of 30 percent. While ethnic minorities constitute around 16 percent of the population, only 7 percent of all new MPs represent ethnic minorities. A number of statements and initiatives made in support of “traditional values” during the election campaign, including a proposal to introduce a gender-specific constitutional definition of marriage contributed to hostility toward LGBTI people. There was a spike in the number of hate crimes against LGBTI people following the elections. The Georgian authorities need to confront this issue by investigating all hate crimes and refraining from rhetoric and acts that fuel intolerance and discrimination. According to the election law, repeat voting is only held with respect to candidates elected by majority vote in single-member constituencies. However, the annulment of results in some polling stations may also have had consequences for the election of candidates by proportional representation through nationwide party lists, as several parties were close to the election threshold of five percent. A few votes more or less may have had significant consequences. It is problematic that the current electoral system enables groups and individuals to influence the outcome of elections by deliberately disrupting the vote, such as by attacking polling stations, which happened during the October elections (see more below). Our statistical analysis also shows that the ruling party received a suspiciously high number of votes in approximately 185 polling stations: Too few to influence the general outcome of the elections, but enough to possibly have prevented smaller parties from reaching the election threshold. Incidents of violence and intimidation of voters in some electoral districts marred the overall impression of the elections. The presence of unauthorized individuals out- and sometimes inside polling stations contributed to a climate of surveillance and pressure in certain electoral districts (according to our observers this was in particular the case in Western Georgia). There were also instances where a disproportionately high number of ballots were declared invalid during the vote count in polling stations where votes for opposition candidates and parties were voided because they were not properly stamped and signed by the Precinct Election Commission. The attack on our observers in Jikhashkari village (at polling station No. 79 in Zugdidi electoral district No. 76) during the first round of the elections is of particular concern. This attack was linked to an attack on the polling station, which appeared to be a professionally executed attempt at disrupting the vote in a contested district (former first lady Sandra Roelofs was running for the main opposition party). Observers representing the joint mission were attacked because they filmed this incident; the perpetrators seized the mobile phones of the observers and destroyed video recordings of their own actions. What was most worrying about the attack in Jikhashkari village, however, was that police officials who were present in- and outside the polling station did not intervene to safeguard the voting process or protect the observers. This created the impression that the attack took place with the tacit approval of law enforcement authorities. The incident is reminiscent of similar, incidents that have taken place during previous elections, although those often have been more violent in nature. The overall assessment of the parliamentary elections will also depend on how the relevant electoral bodies deal with the numerous complaints filed during the elections.